Last week was pretty average. That’s a good thing considering how slow my finds have been of late! Hopefully it’s a sign that business is starting to pick up. This place in Hampstead provided some neat finds. It’s unusual to see such big piles in that neighbourhood. A lot of this stuff came from that house. 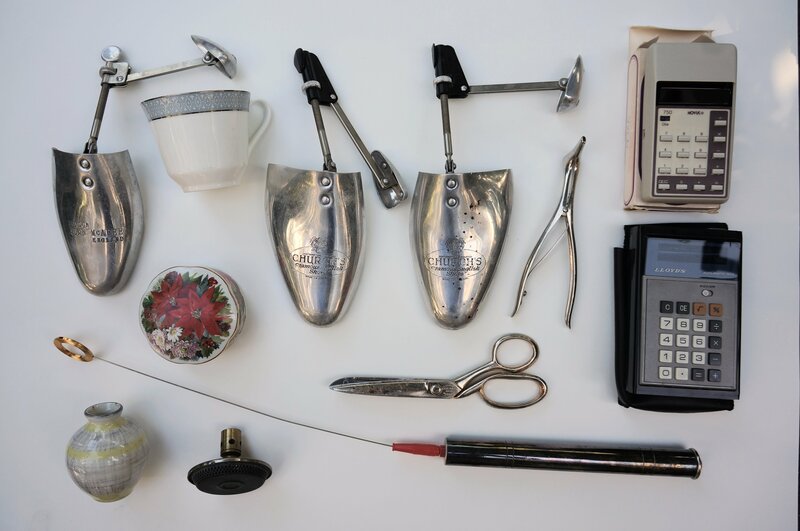 If anyone knows the name for that (probably medical) tool to the right of the shoe tree let me know! 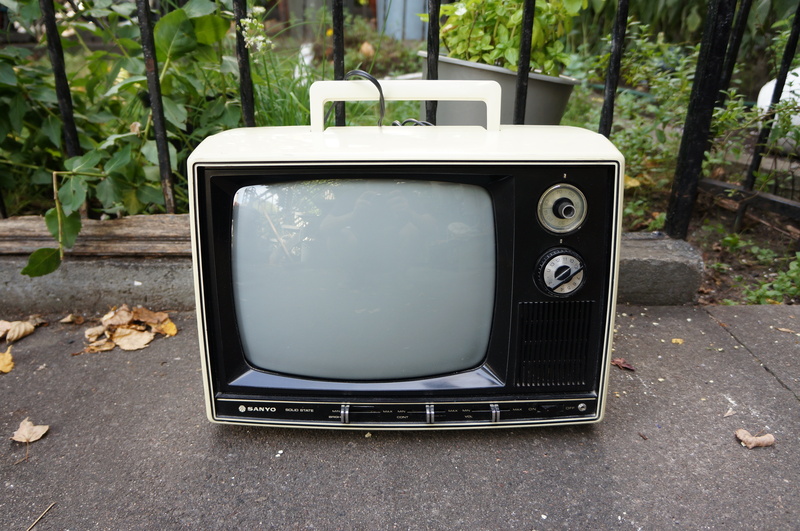 It looks well-made and might be worth listing on eBay, but I won’t be able to look up a price until I know what it’s called. The long thing at the bottom is a bit odd. 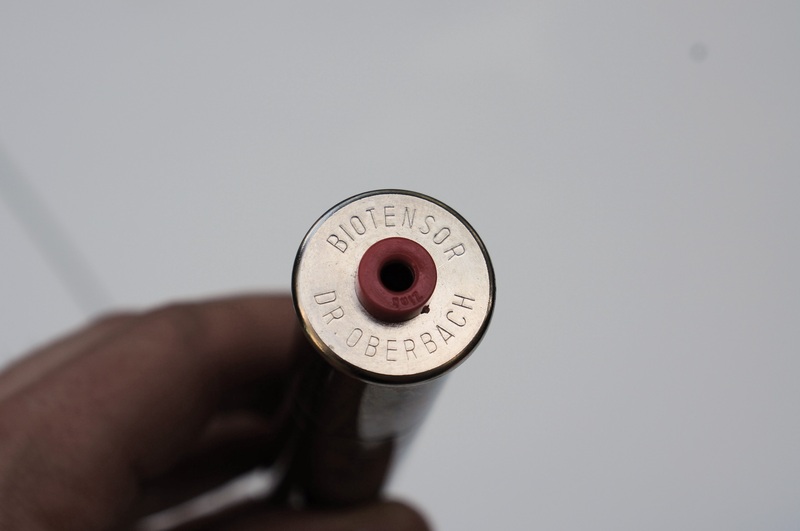 On the base is written “Dr Oberbach Biotensor.” While I had no luck researching this Dr Oberbach guy, I did learn that a biotensor is used to clear energies and is like a mix between a pendulum and a dowsing rod. I don’t have faith in any of those things but the device fun to toy around with regardless. The base has a dark patina – I’d guess that it’s silver plated. I came across a tin full of buttons in one of the bags. I love sifting through this stuff. 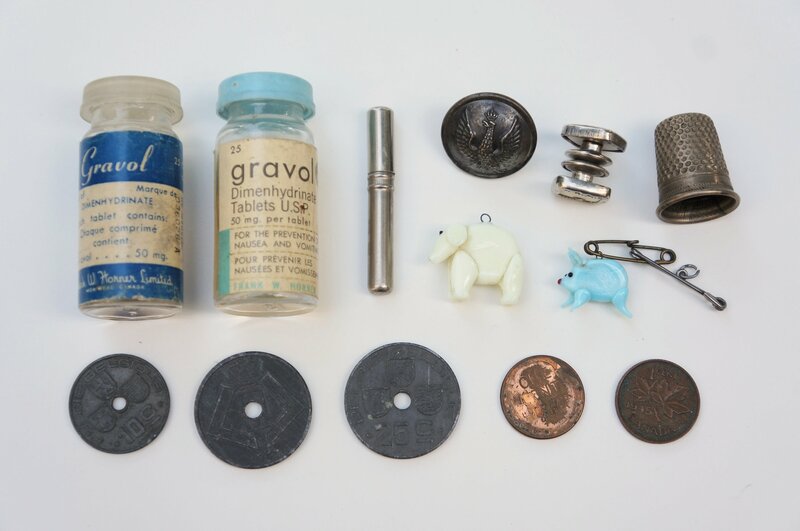 As usual there were some non-button things inside, including two vintage Gravol bottles, a button from one of the world wars, some coins dating back to WWII, and two cute glass animal charms. 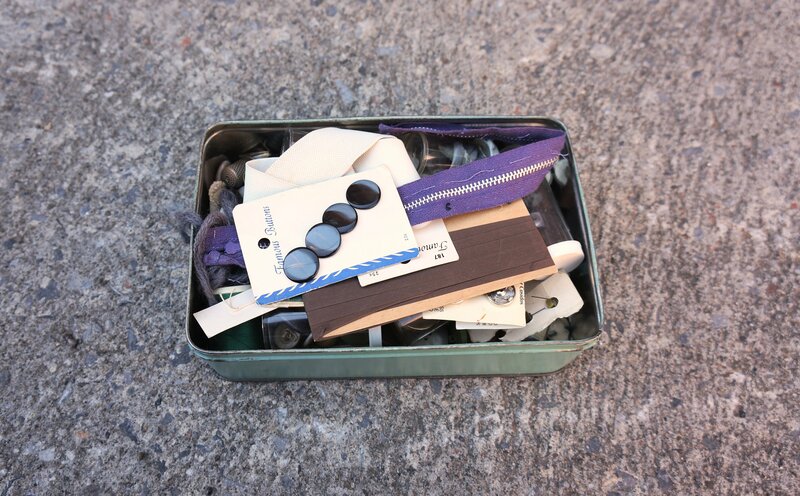 I also found one of those plastic containers that holds nails, screws, and other hardware. None of that stuff was very exciting, but I did find a vintage vial of Valium in one of the drawers. The expiration date is listed as October 1982. I’m not even sure how you would open such a thing – you’d have to break the glass somehow. 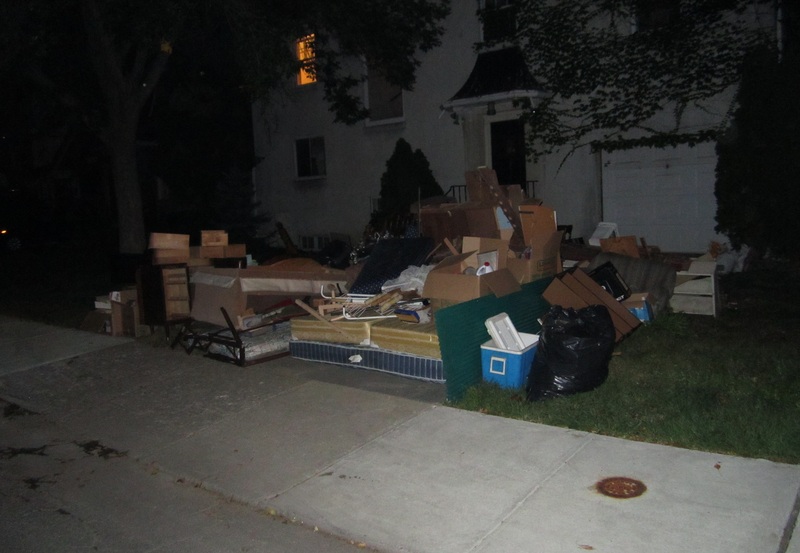 I had a decent run on Tuesday night as well, again coming across a large pile that looked to originate from someone’s basement. 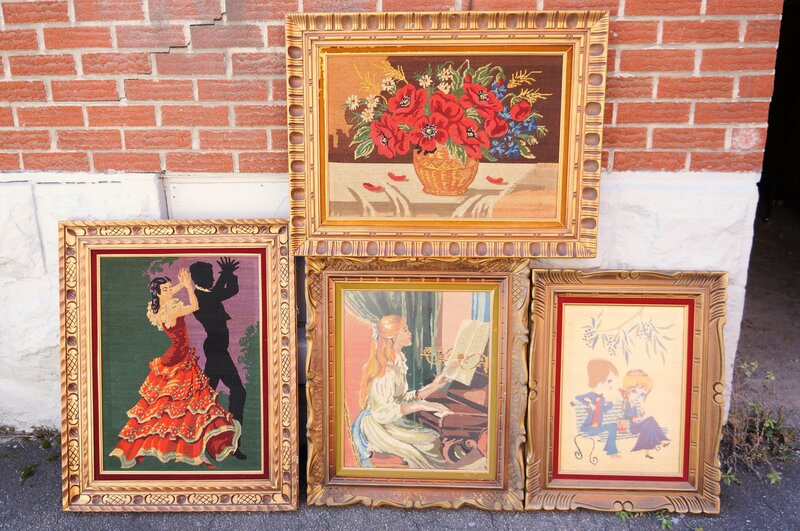 I returned with a haul of great kitschy embroideries and sold one (the girl at the piano) at my yard sale for 5$ – I would have asked for more but there was a noticeable break on the frame. 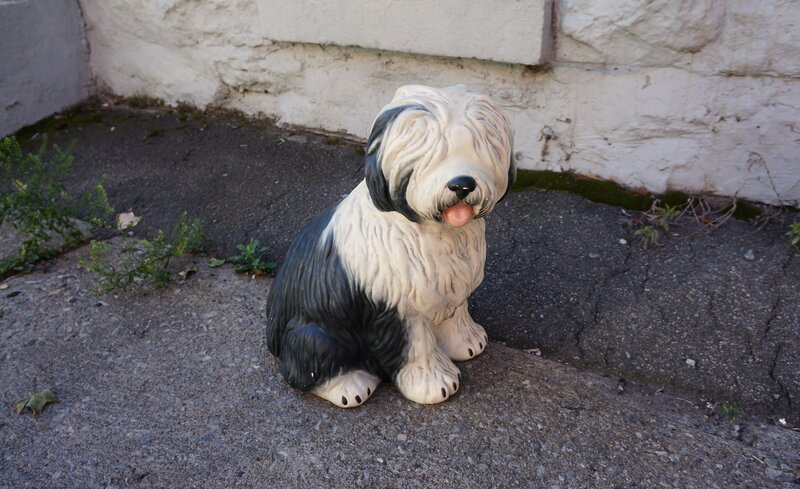 I also saved this large ceramic dog which I’m surprised no one asked about. My roommate likes it as a decoration, so I might just let him keep it. 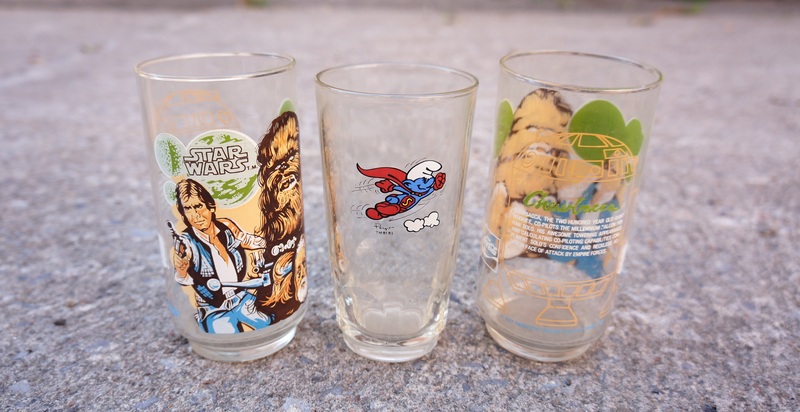 I sold this collection of vintage glasses, two of which were vintage Star Wars (a promotion by Burger King) for 5$. 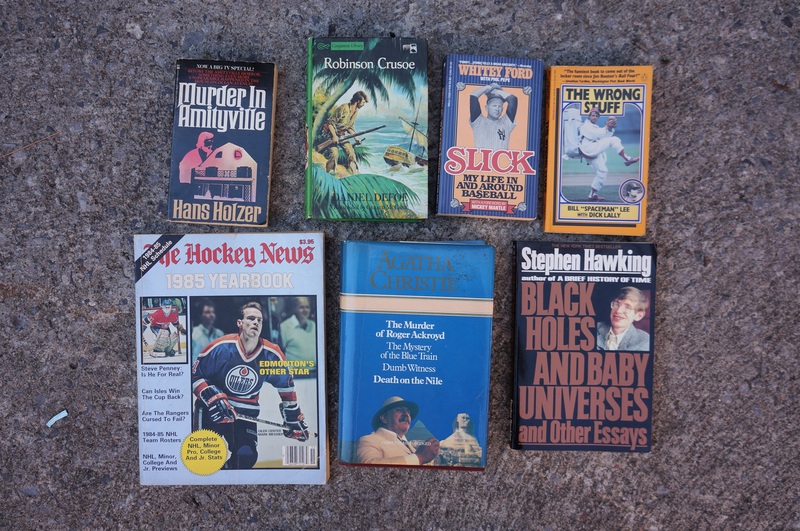 I found a small collection of books, and sold a few (including the Stephen King and Agatha Christie) at the yard sale. 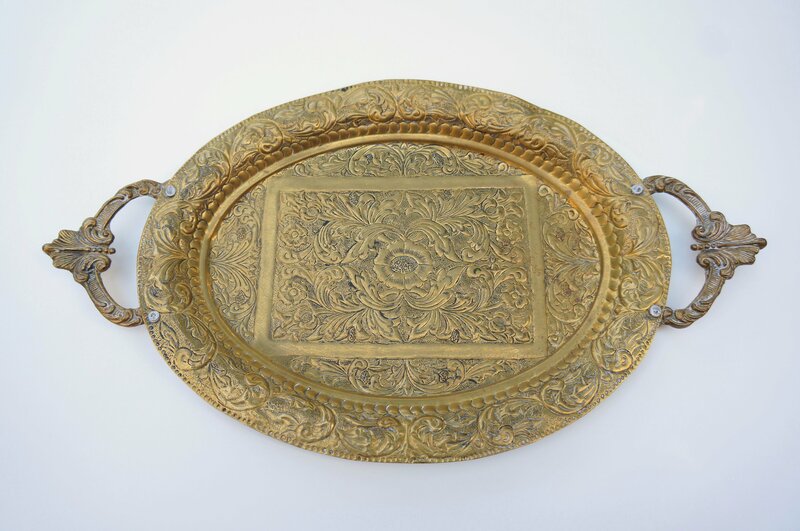 This brass tray also made great yard sale material! I think I sold it at the end of the day for 3$. Maybe I should have asked for more, but my prices tend to go down as closing time approaches. … and a large (maybe 4″ wide) brass medallion. 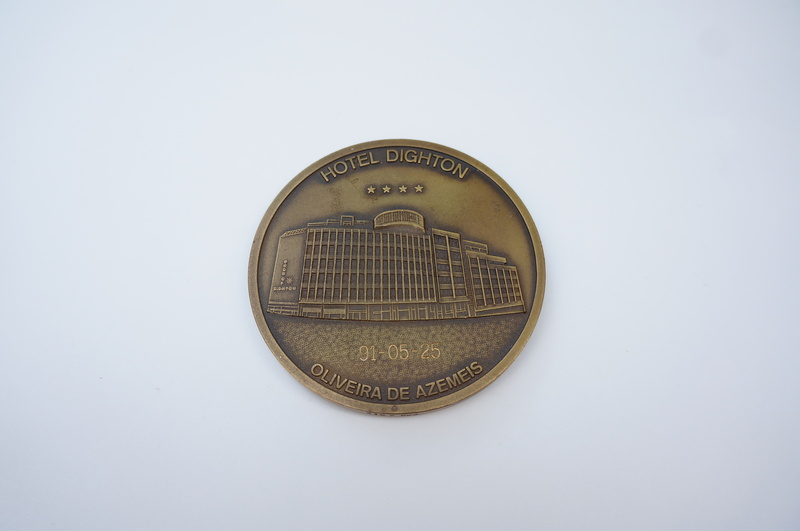 It appears to have been given to an engineer who worked on a four-star hotel in Portugal. I’ve never seen such a thing before, and I wonder if it’s common for engineers to receive them as gifts. My bike rides were pretty productive as well. This find comes with a little backstory. I went to an estate sale in the Plateau a couple weekends ago. The house was very beautiful and was filled with antiques, many of which were from the Arts & Crafts era of design (late 1800s and early 1900s). I also noticed that there was soap. 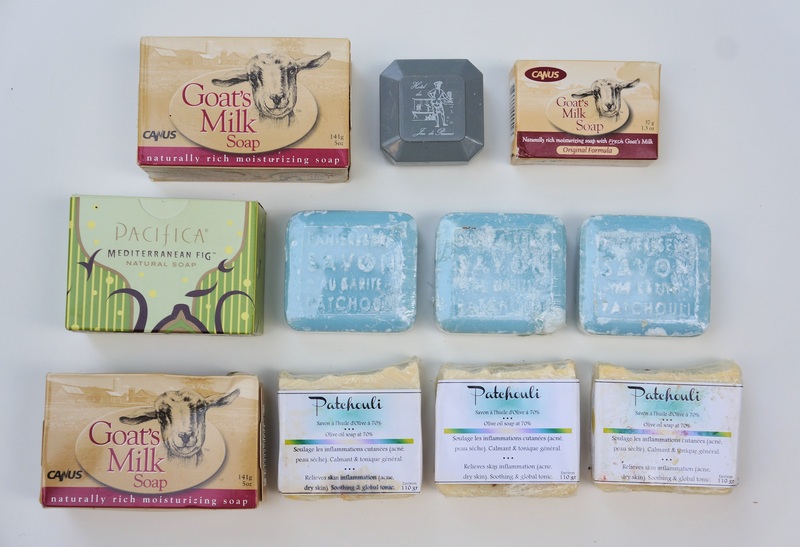 A lot of soap, most of which was a price point or two fancier than your usual Ivory or Irish Spring. I passed by the house the next trash day and what do you know, all these bars had found their way to the curb. I’d guess that there’s at least 30$ of soap here, probably more! I think I have enough soap now to last me the next year. I might smell like patchouli for a lot of that time, but that’s not such a bad thing. The spot also provided some yard sale stuff, including a basic but useful desk lamp that I sold quickly for 5$. Otherwise, a Thursday evening trek through the Mile End and lower Plateau produced a few good finds. One was a fully functional iPod Touch, which I didn’t take a picture of because I flipped it quickly to a friend for 35$. Easy money! Elsewhere I found two nice ceramic pieces. The ashtray on the right was made by Moorcroft, which is apparently a pretty nice brand – the company was given Royal Warrant by Queen Mary in 1928. I’d never heard of them previously. The ashtray has a hairline crack and a couple tiny “flea bite” chips along the crack but might still be worth eBaying – similar ashtrays in perfect condition go for around 40$. 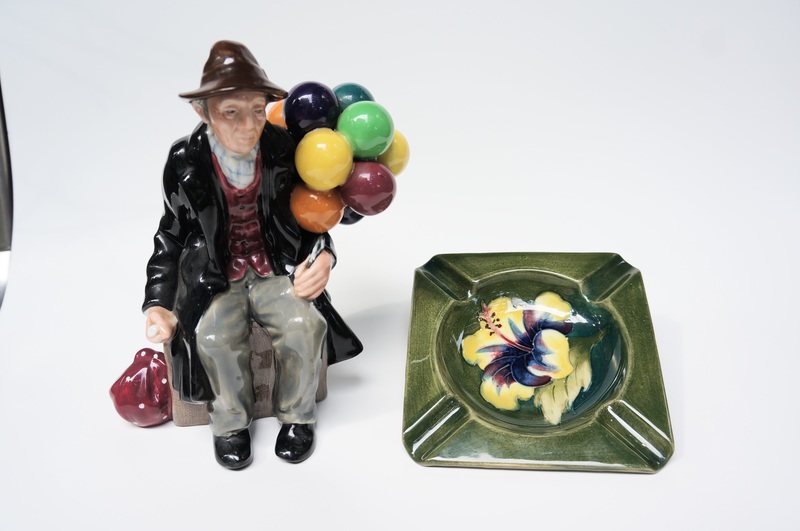 On the left is a 7″ tall Royal Doulton figurine called “The Balloon Man.” The piece is in excellent condition having somehow escaped damage through years of ownership, not to mention being put in a bag and placed on the curb. The design has been retired since the 90s and looks to be worth a bit of money. I listed mine for 85$ , which from what I can garner through eBay’s completed listings is a realistic price. At some point I hope to find something spectacular again, but in the meantime I’d be perfectly happy if the averageness continues! This week so far has been pretty good, and I have a chance of achieving above-averageness if I have any luck on Thursday and Friday. I’m doing a yard sale tomorrow if anyone wants to come by! I’ll be at 4100 Coloniale near Duluth in the Plateau from around 12-6pm. Included in the sale will be these cool and kitschy embroideries, a 1.5′ tall ceramic dog, and a bunch of other stuff I’ve found in the last few weeks. I won’t be doing many more yard sales this year so come while you can! I’ve been picking for many years now and have found lots of different “things” along the way. While most of my finds these days have a familiar (but nevertheless novel) quality I still occasionally happen across something I’ve never seen before. Usually it’s a tool of a trade or profession, or something related to a fairly niche interest. This time it’s hate literature published by various far-right, fascist, and Neo-Nazi organizations in Canada and France. To be clear I’ve come across racist items before (like the Chief Wahoo toy I found a little while back), just nothing relating to or promoting any kind of overtly racist movement. It’s fair to wonder if humanity would have been better off if I left these in the trash. However, I think it’s important that they continue to exist. These publications are actually pretty hard to find and might prove valuable to someone interested in researching the topic. And there’s always that old George Santayana quote: “Those who cannot remember the past are condemned to repeat it.” It’s good to remember that these types of ideas still exist, even if we may not see any evidence of them within our social bubbles. The literature dates from 1980 to 1994 and was published by a few different organizations. I’ll describe the groups briefly in the next few paragraphs, but if you prefer not to read about such things check back for my next post – I promise that my it will be very charming! (Hint: this week I found a great collection of kitschy embroideries and a large ceramic dog). 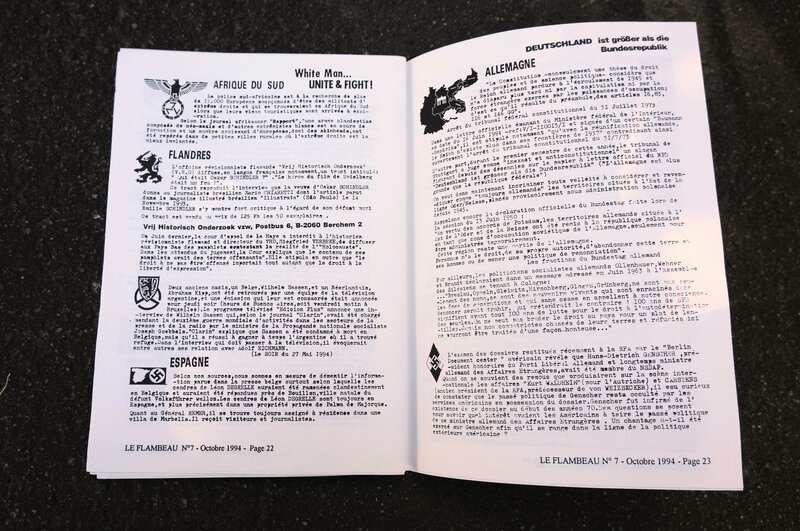 Le Flambeau was published by the PNFE (French and European Nationalist Party), a group of French Neo-Nazis and Skinheads that operated between 1987-2000. One of the covers celebrates the life of Léon Degrelle, a Belgian Nazi collaborator who later fled to Spain and became a prominent figure in fascist and Neo-Nazi movements. This group was blamed for several attacks on immigrants as well as the vandalism of a Jewish cemetery. 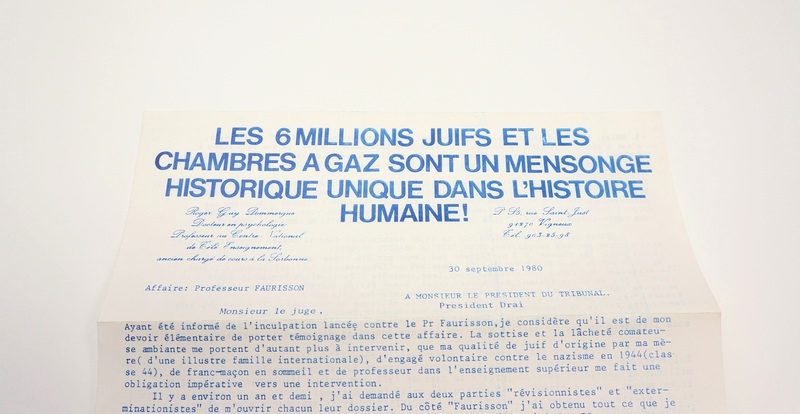 I haven’t looked to much into this pamphlet (that block of text would seriously challenge my French skills), but from a glance it seems to be a letter by Roger Dommergue (a holocaust denier) defending a guy named Robert Faurisson (another holocaust denier) against some type of charge against him. Jeune Nation was a magazine run by the Cercle Jeune Nation. It’s hard to find any reference to it online outside of this 1996 article discussing Quebec’s Catholic far right. 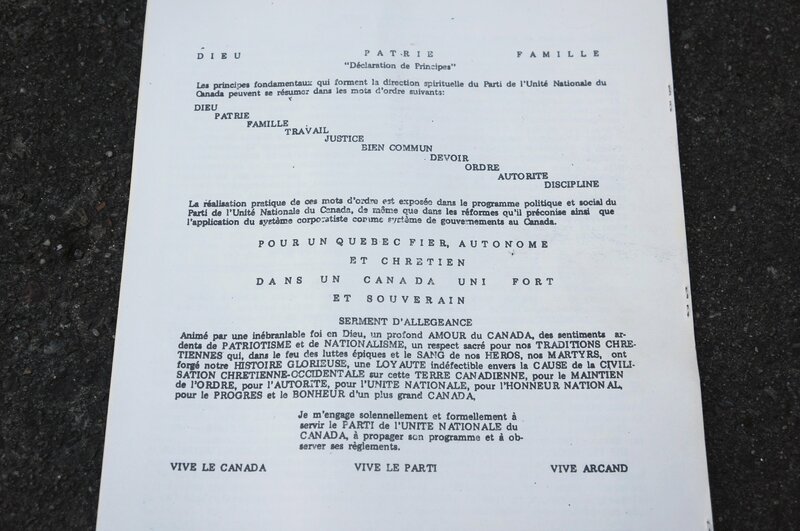 According to the article, Cercle Jeune Nation sought to “to construct a French Canadian fascist ideology” and considered race and religion the cornerstones of “a ‘true’ French Canadian identity.” This issue features an article by Günter Deckert, a holocaust denier who once led Germany’s far-right National Democratic Party. I have several copies of this magazine as well as a letter acknowledging a donation to the organization. Cercle Jeune Nation appears to have been based out of Laval, Quebec – just north of Montreal. Serviam was (perhaps still is?) 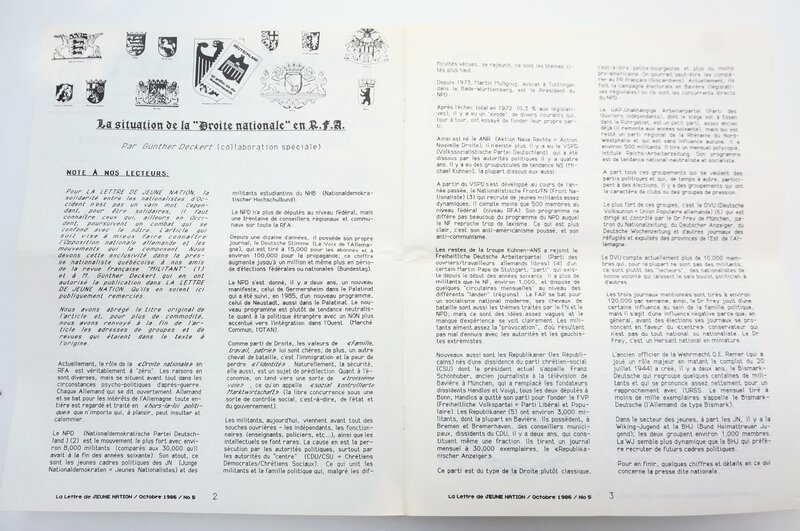 the journal of Canada’s National Unity Party. That party was created in 1934 by Adrien Arcand, a nut who referred to himself as the “Canadian Führer.” The party was banned in 1940, but it appears that they continued on an unofficial basis after that point. The Serviam magazines I found were all published in the mid-1980s. 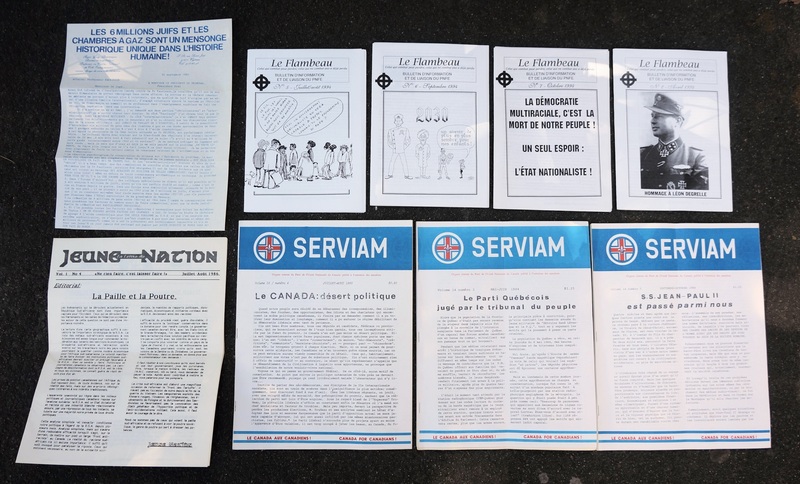 Each issue ends with a “Declaration of Principles” and the slogan “Vive le Canada; Vive le parti, Vive Arcand.” These magazines are largely French but also include the occasional English article. A potentially interesting side note here is that I found these papers at the same spot that provided the interesting UFO ephemera a while back. I’ll be sure to keep an eye on that spot going forward.